Ladies and gentlemen, boys and girls, step right up and gather round cause there's plenty of room for everyone! Honestly. You will not believe your eyes this July 2014, as DC Comics will present to you another chapter in RB Silva and Scott Lobdell's tale of intrigue and woe! Woe I say! Prepare yourself for much woe! To QUOTE Alain Resnais: “The present and the past coexist, but the past shouldn't be in flashback". I know you were all worried about what path this issue would take. Will we learn more about the terrible enemy our heroes made last issue? (“That is, an enemy that will fill you with terror. Not that [he is] terrible at being an enemy.”) Or will we follow our pretty panicked princess to find out what freaked her the hell out? Or will we split the issue in two again and have an awkward interlude in the middle? Who picked the second option? I bet you picked it! You're so smart. You win!! We'll just totally ignore my new favorite unnamed pedantic enemy terrorist mastermind guy. Instead we'll find out what was so horrid that it sent Koriand'r off in said panic. Doctor Palmer suddenly finds himself obsessed with the spaceship wall before pulling a Houdini on the boys. And -- spoiler alert! -- we've got a big reveal about Doctor Langstrom for those of you who have never read a Bat-family comic . . . or seen any animated Bat-things . . . or talked to anyone who has, y'know, used the internet. But first, my fine friend, a flashback sequence to put the pretty princess's panic in perspective. Who doesn't love seeing teenage Koriand'r in her adorable little jumpsuit? (If you don't, I'm revoking your points for picking the second option earlier. You lose!). RB Silva's drawings of the big doe-eyed Kori and the cat people of Eseru Prime are absolutely awesome. Yes, he's continuing Sandoval's habit of ensuring every issue has the classic Pérez head-on shot of the flying Tamaranian chest. But if you can see past the breasts (which are at least consistent compared to his predecessor), its fairly amazing the range of emotion Silva can capture in a face with no pupils. Silva also gets mad props for putting a friendly smile on the face of a Dominator. Even if Depalo -- the aforementioned Dominator -- is casually pointing his gun towards the people the crew are rescuing whilst talking to Koriand'r with his back to her. As a fan of continuity, I always appreciate it when artists represent a crowd of aliens with a mix of races we recognize from other space-comics instead of just generic green guys. The Xundarian and other species populating Earth's wretched hive of scum and villainy serve to make consistent-universe-dorks like me happy. Of course, they also raise the obvious question of how long all these species have been here and what other heroes (and villains) know about them. I really enjoyed the writing in this issue. 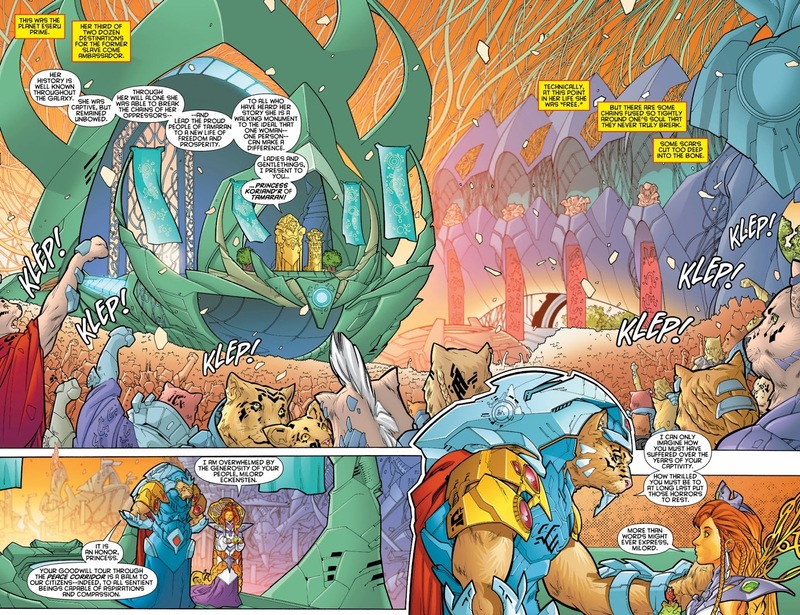 From Lobdell's rendering of the hollow political rhetoric of Lord Eckensten / to the disgruntled musings of his royal guards / to the casually righteous fury of young Kori, he managed to capture a great amount of character depth in just a few ultimately irrelevant lines. Granted, this series has always been called “Red Hood and the Outlaws,” but I'm fairly certain the word “outlaws” has never been uttered within its pages. I'd always assumed that Roy, Kori, and Jason were sequestered off on their island to keep a low profile, both from their former partners or team mates and the world at large. They steal, they kill, they do their own thing. They don't, as far as I can recall, parade around pronouncing themselves “The Outlaws” to anyone. Do they? But now we're calling them “Outlaws” like it's their team name? 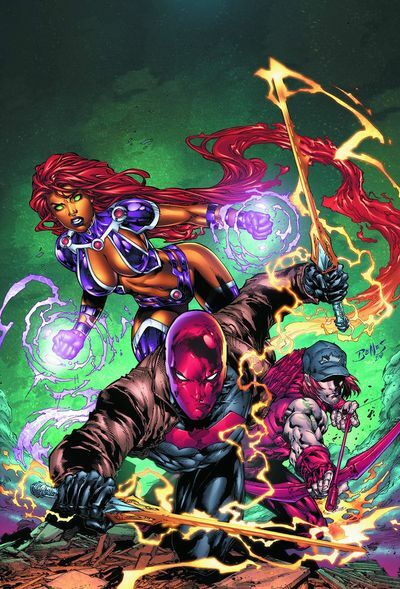 And Starfire is all “best known on Earth” as a member of this team? Like common folk wandering the streets know who she is and know she hangs with Red Hood and Arsenal and they go around doing things that aren't really condoned by the superhero community at large? And all these people of Earth are cool with this? I'm not complaining. I just want some explaining. Please and thank you, Lobdell!? Otherwise, there's not much to criticize. Maybe the dropping of last issue's opening half, but this is a monthly series – we can't juggle too many threads at once. This was a very enjoyable issue. “See these eyes so green...” It may not have entered my head until I typed the words “cat people” above to describe the populace of Eseru Prime, but once it was there, David Bowie's title track from the 1982 remake of the film of the same name worked in so many ways. Starting from the very first page, both literally, figuratively, and musically, all the way through to the final scene of, well, “putting out” a fire of sorts. This was Kori's theme this issue. Please play at full volume. All incarnations of Princess Koriand'r's back story deal heavily with slavery, but we don't always get to see versions of her from after she gained her freedom and before she became a Hero of Earth. 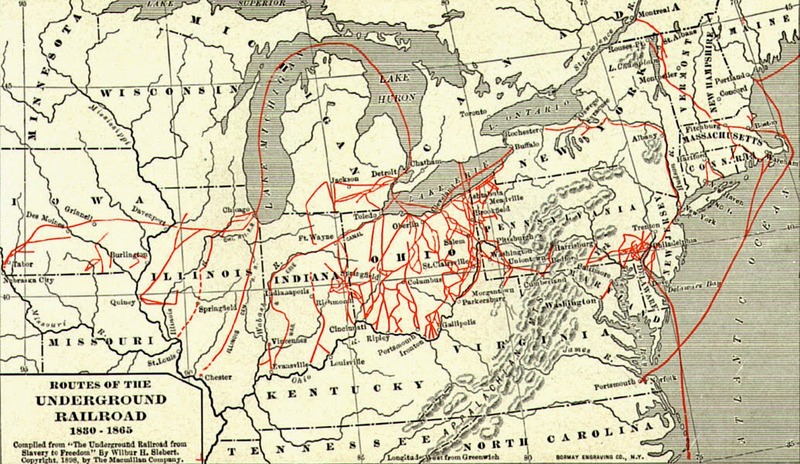 And it's that part of our tale that's made me think about the Underground Railroad of the mid-19th Century -- which helped African slaves in the southern United States escape and reach freedom in the northern States and Canada. As someone who originally saw Starfire's inclusion in this book as a waste of a perfectly good opportunity for a non-powered trio, she has certainly grown on me. This issue was totally a Starfire feature -- quite possibly one of the best Starfire stories of the New 52. While it mostly just raised questions about not only her current actions, but also her past activities and at what point that path brought her to Earth, it was a hell of ride as well. I'm not sure if I like the very pre-Crisis narrator style boxes that have suddenly appeared, but if you're a fan of them, we've got them in spades! It's a little jarring at first, as you're reading a modern comic and for the most part we get our narration in character boxes with a little icon to indicate who's narrating. But in Red Hood we now get a full-on third party omniscient narrator that goes so far as to introduce characters we've met in past issues. While it might be jarring for some, it certainly improves the ability for a casual reader to jump in to this title for this current arc without needing to go track down the 33 prior issues. Where the hell did Dr Palmer go? Seriously! He was there when Kori flew off, then this issue we see him briefly, manhandling the alien ship right before Roy and Jason storm on board, and then . . . gone! Coffee break? Plausible deniability when Father Time asks if Langstrom hulked out or not? And that other guy? The S.H.A.D.E. I.T. guy apparently hooking up a computer in the corner of the room moments after the golden alien girl freaks and busts out? Does anyone at S.H.A.D.E. know about the robo-bees using lasers to bore holes in the hull of the said alien ship? That doesn't seem to be very productive. Should bees really be in the Ant Farm anyway? Has any book -- pre- or post-Flashpoint -- explained how so many alien races can easily disguise themselves as human and walk among us? Does Grifter know about this place in Abu Dhabi? Is that big guy that Kori “found” at the end a Bolovaxian? Or is it Roseanne Bar? Disney alert! Why is little baby space-kitty (not to be confused with Kitt'n) named for a hotel in Madagascar? Is this intentional?